Looking for a gym IN DUBLIN? Triple Force is for YOU! All Levels Programming...Yes, We Do! Small gym....Yes, we care about the things that matter, everyone will know your name, coach to athlete ratio 1:12! Varied Needs...We offer goal based programs and coaching options. Welcome to Triple Force located in Dublin, OH. Our goal at Triple Force is to provide our members a fun atmosphere while achieving their health and fitness goals. How often do you get out of a chair each day? We call it a squat. Or maybe you have to pick something up off the floor: a deadlift. At Triple Force, we want to make you better at everything, and we do that by addressing each of the ten domains of fitness: speed, strength, cardio respiratory endurance, power, flexibility, balance, coordination, accuracy, stamina, and agility. We work on all of these domains every week, but we devote more time to some than others: it will take a lot more time and effort to increase one’s strength than to improve accuracy. Triple Force group coaching is perfect for those looking for a supportive community that works together to become healthier and happier. Our Programs are CrossFit and ForceFit. CrossFit - Unlimited CrossFit memberships include access to all crossfit classes, access to coaching staff and ability to use the facility and gym equipment during open gym times. CrossFit Classes are offered Monday – Saturday and each one is an hour long. In those 60 minutes, you can expect to get in a daily dose of strength, cardio, endurance and more – all aiming to turn you into a stronger, more efficient athlete. ForceFit - 2-3 day a week program of high Intensity Interval training with heart rate monitors. ForceFit Classes are 40 minutes with 3 interval stations. Intervals include row/run, assault bike and plyometric/weight. Classes are always clocked. No Barbells or Olympic Lifts will be used in a ForceFit Class. Class sizes are limited and signups are required. Personal Heart Rate Monitors will be used to help you reach your target heart rate with target heart rate zones posted on the tv screen. You’ll find that everyone at Triple Force will be cheering you on. Triple Force makes you feel empowered, confident and strong. We come here to work out and get better. Period. If that sounds good to you, come on in and let’s get to work. Carol discovered fitness in 2000 and never looked back. Growing up, she was surrounded by fitness and competitive sports. She has been involved in some capacity through, dance, cheer, gymnastics, Olympic lifting and kickboxing for over 20 years. So it was hard for her not to become a big advocate for fitness and living a healthy lifestyle. Carol taught 3 out of the 4 programs offered at CoreTactix; CrossFit, Krav Maga and Kickboxing and is now the owner of Triple Force CrossFit. She has been a Certified Kickboxing Instructor since 2006. She successfully completed her Krav Maga instructor training certification in November 2007. She is a CrossFit Level 2 Trainer in and a certified CrossFit Judge. Geanna joined the CrossFit program in September 2012. She has always been a member of a gym and have been very active, but it wasn't until she found the world of CrossFit that she fell in love. Geanna played softball at The Ohio State University, so she has always had a passion for competition. CrossFit allowed her to set personal goals and see results. Geanna received her Level 1 CrossFit Certification in July 2013. She also enjoys changing up her workouts with conditioning and kickboxing classes. When she's not at the gym, Geanna enjoys spending time with friends and family. Nick was introduced to Crossfit in 2012 by his brother. He was hooked by the CrossFit methodology immediately and attained his Level 1 certification within the first year. 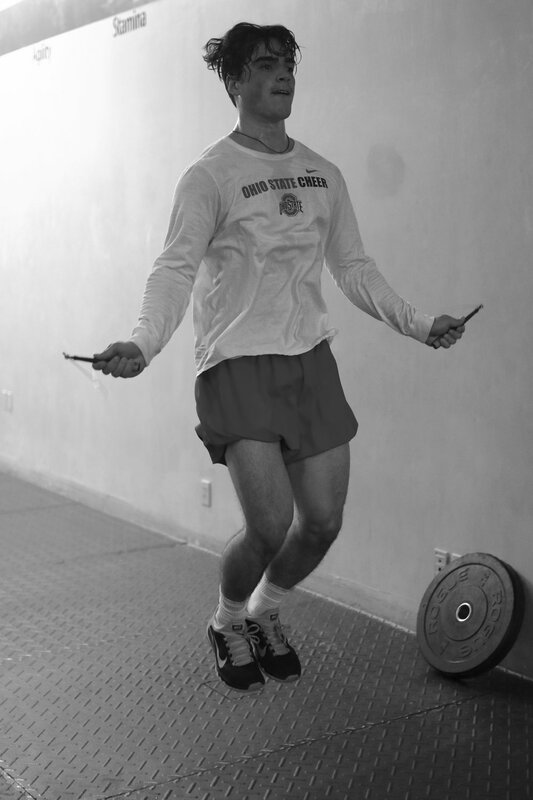 CrossFit has positively affected Nick's life in a number of ways. He has lost almost 30 pounds and is stronger and more fit at 37 years old than he's ever have been. CrossFit has also helped in his business. Nick owns and operates his families restaurant, Phillips Original Coney Island. CrossFit has helped him manage his stress much better and given him more energy during the work day. Nick looks forward to those days that he coaches — knowing that what we are doing inside of the gym can be so rewarding outside of the gym. Jim has always been active in athletics and physical fitness, as well as being a successful head football, lacrosse, baseball and basketball coach at many levels. A graduate of The Ohio State University, Jim worked as a Special Agent for the Ohio Bureau of Criminal Investigation where he worked strictly undercover for four years before being recruited into the United States Secret Service and then into his current position as a Special Agent for the United States Department of Homeland Security. Also a graduate of the Federal Law Enforcement Training Academy in Glynco Georgia, The United States Secret Service Training Academy in Washington D.C., and the United States Homeland Security Investigations Academy in Georgia, Jim finished first in all academy's as evaluated on academics, physical fitness and weapons proficiency. When not at Triple Force CrossFit, Jim enjoys spending time with and entertaining family and friends. Jim and his wife live in Dublin with their three active children and three spoiled dogs. Sara's love for sports and fitness began in 6th grade with cross country. Throughout high school, she also competed in gymnastics and ran track. In college, and up until she found CrossFit in March of 2012, Sara was in the weight room three days a week and on the treadmill in between lifting days. It was boring and she missed the competition as well as being part of a team. Sara saw a commercial for CrossFit, went to the intro, and never looked back. Sara became a CrossFit Level 1 coach in November 2014 and has been instructing since. Naturally, her favorite CrossFit movements are gymnastics, but she loves how powerful picking up a heavy barbell makes her feel. She has a degree in Nutrition & Community Health from The Ohio State University and worked for a major nutrition company here in Columbus for eight years before becoming a stay-at-home mom. Her husband Dave, is a CrossFit assistant and Adaptive Physical Education Teacher. Their daughter, Lily, loves coming to the gym to see our "Fit Fam". She is only 16 months old now, but Sara knows she will love CrossFit too when she is old enough. Outside of the gym, Sara loves cooking, hot weather, reality TV, and her weenie dog Griffin. Dan, is a firefighter for Norwich Township in Hilliard Ohio. Dan has always been involved in sports as a player or coach. Dan started his career as a coach back in 92 as a trainer for a local gym. Dan has coached a high level softball travel team as well as Hilliard Darby softball and was on staff from 2010-2013 for Ohio State softball. Dan started crossfit back in 2014 with my daughter, to help her with her recruiting process and fitness. In the process he found it to be the best workout for his job and overall health. His son, Collin has joined to help with his fitness and to be better at his sport. Dan took his level One in August of 2017 and looks forward to helping others. When Dan has free time he enjoys spending time with his wife Tonya, going out with friends and traveling to watching his kids play their sports. Steve discovered crossfit while in college in West Virginia. He had always stayed active, but had grown bored with the typical weight lifting/cardio routine. Once he discovered crossfit, he was quickly humbled, but instantly hooked as well. Steve was attracted to the structure and efficiency of the classes, as well as the intensity of the workouts. Steve also enjoyed working out with other people, where everyone pushes through the same workouts together. Steve always knew he wanted to receive his L-1 and eventually coach. He felt that not only would it teach him more about the sport, but also allow him to help others pursue the same fulfillment that crossfit has given him. He enjoys getting to teach others, meet new people, and work out all at the same time. I come from a family of children playing sports year round. I grew up playing lacrosse, running cross country. I continued to be involved with athletic endeavors through cheerleading and being apart of the Brutus Buckeye program at The Ohio State University. I earned my Bachelors of Science in Pharmaceutical Sciences at Ohio State in 2017 and will be attending medical school next year (don't know where but I at least got in somewhere so I can say I'll be going). I was introduced to CrossFit at Triple Force but have been using Olympic movements as my primary athletic training since 2009. Outside of the gym, I am researching this year under two oncologists at Ohio State. I enjoy cooking, long walks on the beach, and high fashion. Hah just kidding, I do like cooking though. We are pet friendly at TFCF. So hopefully you like doggie cuddles and few wet nose kisses from our pups. Gris is the main gym dog. If you need a running partner, he's your man. He loves treats and will quickly volunteer for a cool down walk after each class. Copyright © TFCF – All Rights Reserved.